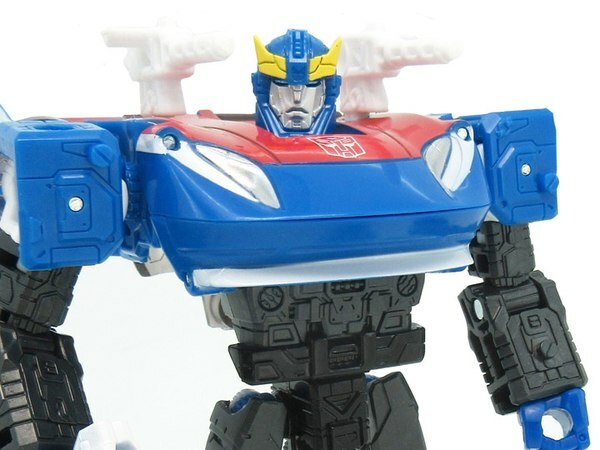 After years of being a "me too" Optimus Prime rehash, Ultra Magnus breaks away from being 2nd banana. 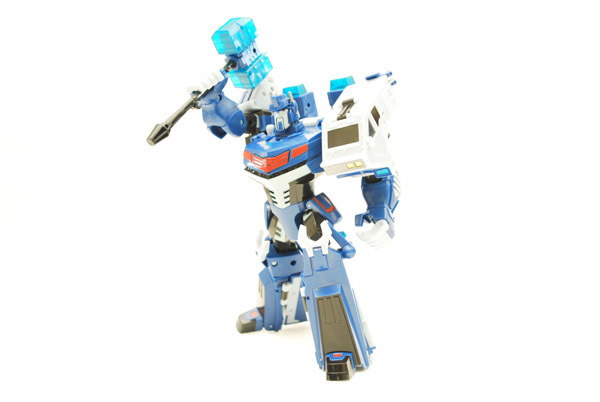 For Animated, Ultra Magnus becomes his own bot. Not only that, he also outranks Optimus Prime! 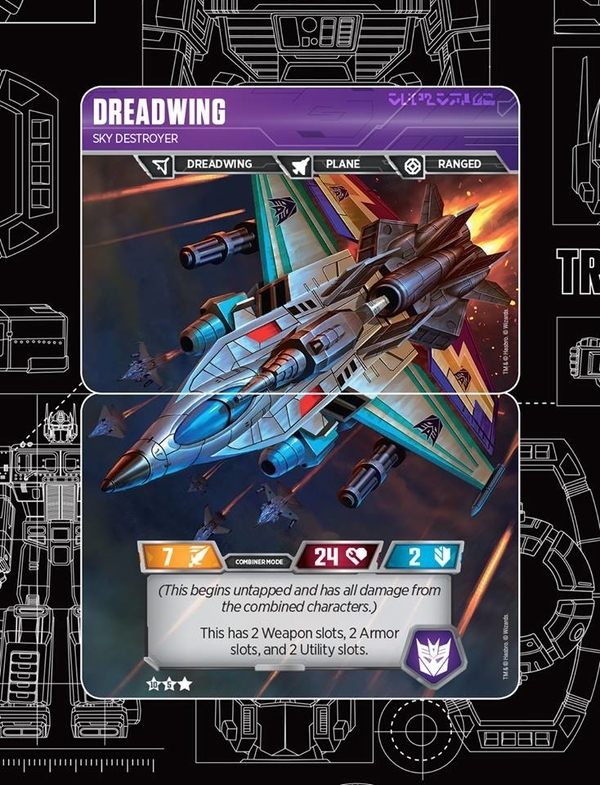 This review features the Leader class figure. 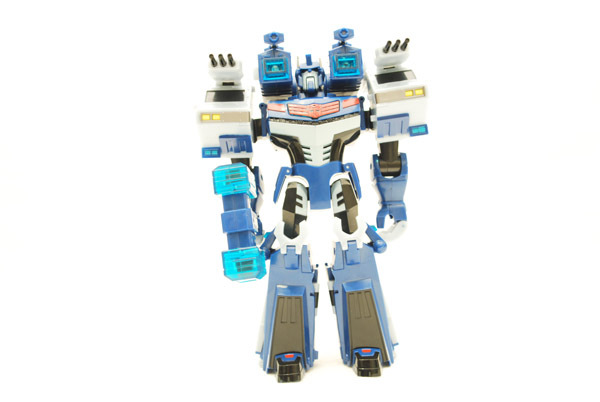 Commander of the Cybertron Elite Guard, Ultra Magnus is the most powerful Autobot warrior in the galaxy. 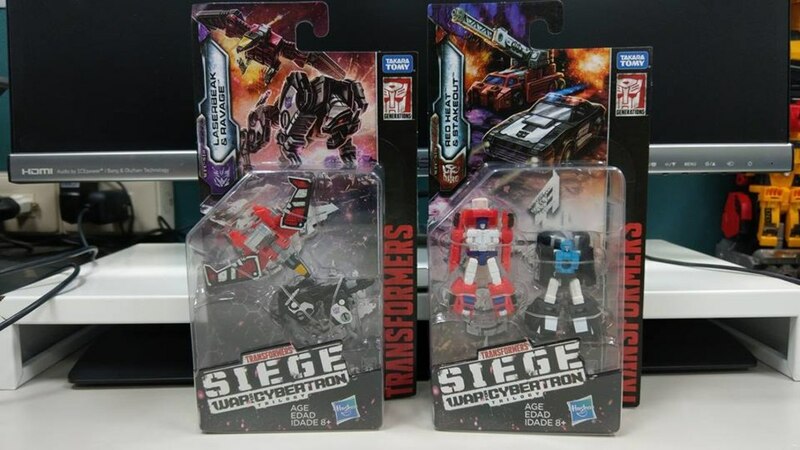 He has trained for hundreds of years in all forms of fighting known on Cybertron, and several other planets. 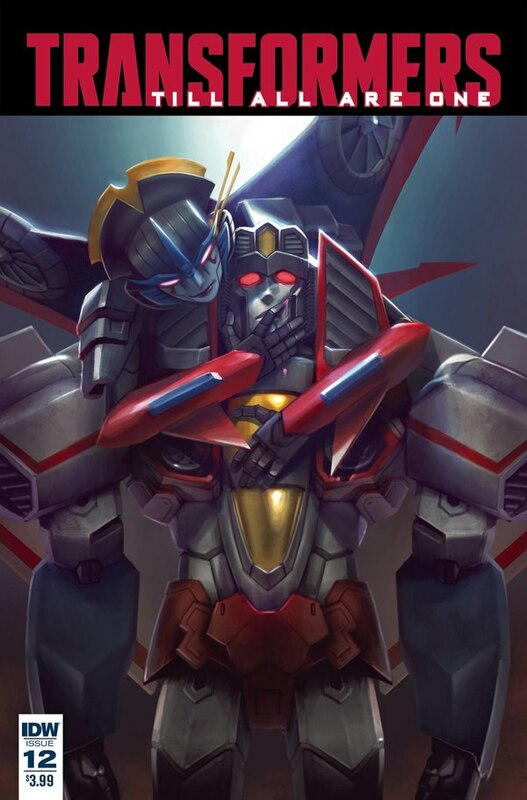 No Autobot is more courageous, or more dedicated to the protection of life and freedom. 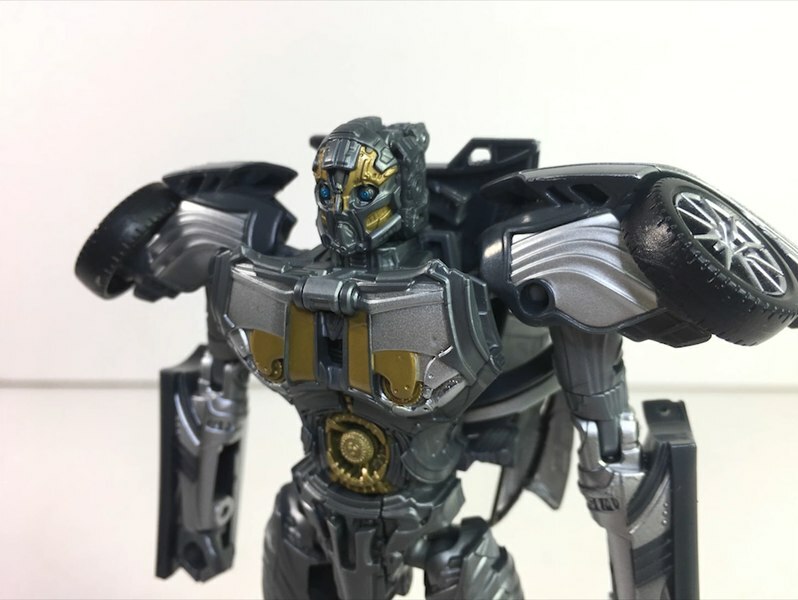 He is a master tactician who has never been beaten on a battlefield, and was instrumental in driving the Decepticons from Cybertron and into deep space. 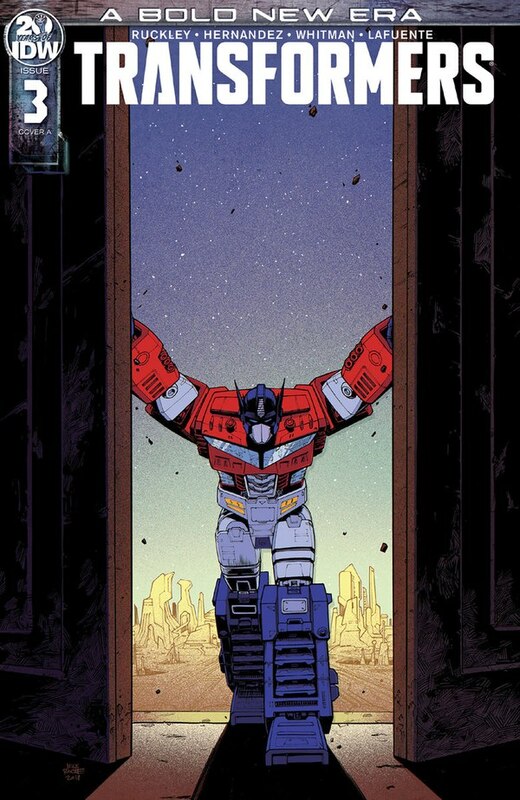 1) "Don't be a hero, Optimus. It's not in your programming." 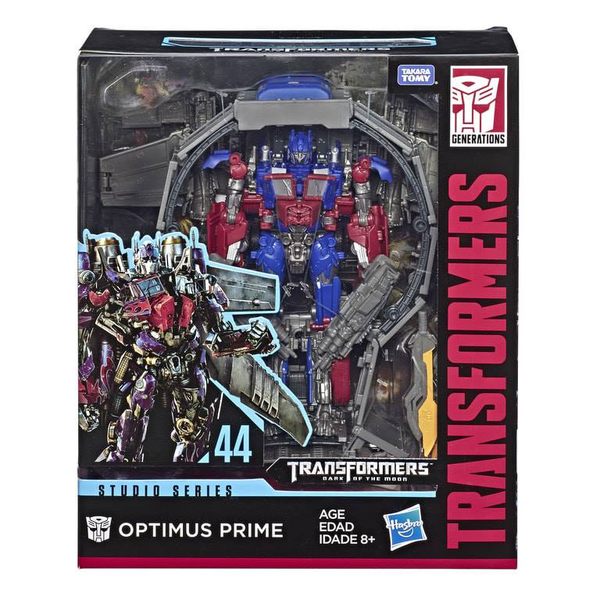 2) "We must return the Allspark to Cybertron." Having the voice actors for the show do the voices for the figures is the best move they could have made. Generic voices in the past have been a turn-off. The Mass-hammer can fit into either hand. There is a tab just above the central joint that lines up with a groove in the palm of either hand. This is the only way to keep a stable grip on the hammer, but it cuts short it's usefulness as a weapon. You can also have Magnus grip the handle just below the joint of the handle, but it's not as stable. IF you grab the base of the hammer and press up, the ends of the hammer expand out. This isn't Magnus' only weapon. 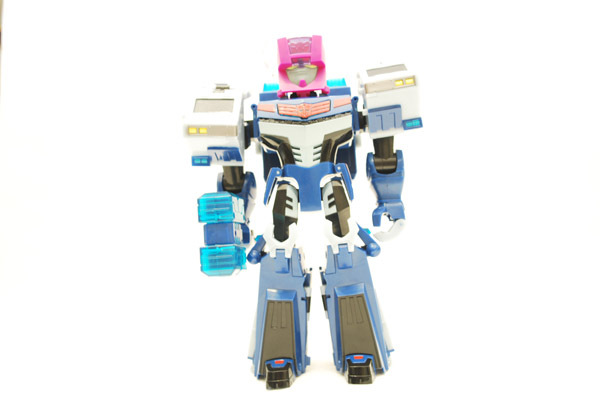 In case anyone was wondering, the Headmaster can use Ultra Magnus as a body. However, there are no new sounds to unlock. Start by pulling down the cab halves on his shoulders to expose cannons. Lift up the cannons, then close the compartments. At this point, you can choose to either leave the cannons on a hinge, or lower them to rest on the shoulders as the instructions state. There is a small tab on top of these cannons that can be pushed forward to extend the three barrels. The headlight panels can be swung out and inward to expose gatling guns. However, it's very stiff and might need coaxing. Pull the backpack up just enough to access the tabs on each side. Operate the lever so you expose 2 heavy cannons and extend them forward. Complete flipping the backpack so the cannon setup rests on his shoulders. 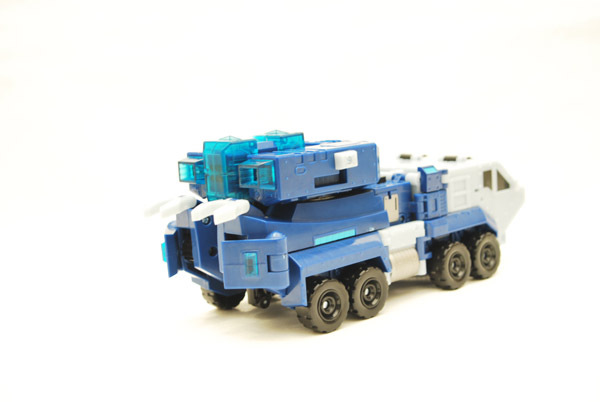 Ultra Magnus definitely packs a punch in this mode. The barrel shoulder cannons have versatility as you can pivot them around to get a good vertical angle for firing. Hips: Dual ratcheting hinges, 180 degree 8pt bend with 90 degree 4pt spread. The waist has no articulation, but the rest of the joints more than make up for that shortcoming. 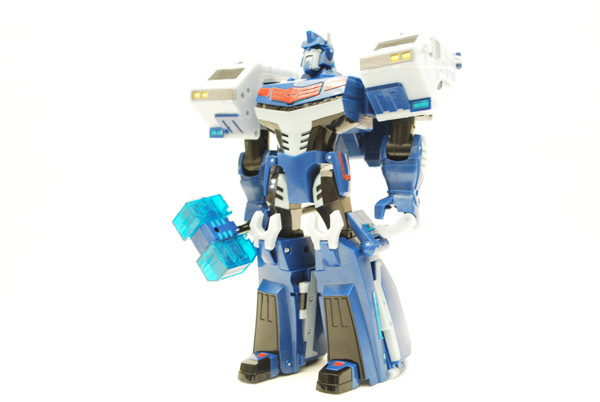 Ultra Magnus has the kind of transformation you'd expect from a Leader class figure. Start by grabbing the shoulders at the joint base and flipping that block 180 degrees so the blocks line up against each side of the head. This movement will be accompanied by a transform sound. You'll see where the cab halves are mounted via a 2-piece hinge. Work the hinge so that the cab roof is flush against the shoulder assembly. They might be tight, so you might have to work them a bit. Fip out the little tabs on the cabs. Bend the elbows so the fists stick out forward. Rotate the shoulders so the fists point down. Now, position the shoulder joints up and inward until the cab halves join together. Flip up the small tabs that are on the sides of the chest to complete the front half. Flip the backpack up so it's perpendicular to the body. 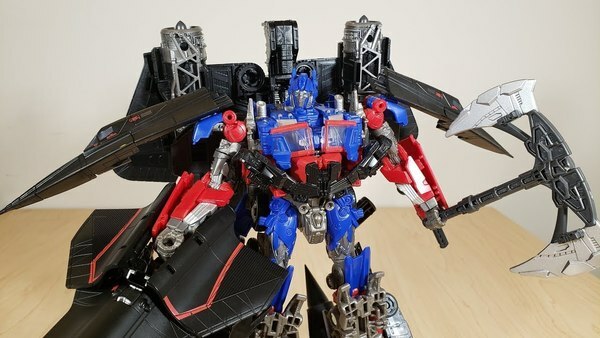 Flip up the tabs on the side of his shoulders so they stick straight out. Grab the sides of his shins and pull the wheel assembly out 180 degrees. Position the 2-stage pin hinge assembly so you move the wheels from the inner leg to the outer leg. 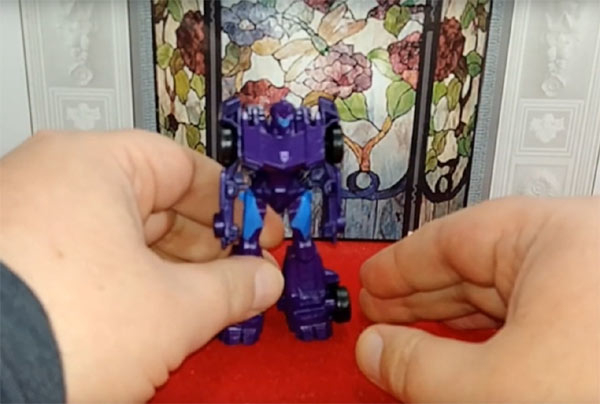 Flip the feet into the legs. Rotate the legs back and around. Take the hammer, fold the handle in half, then tuck it into the round port towards the back of the vehicle. If done right, there are cross tabs on the hammer that will line up to slots on the back. Fold in the tabs on the rear end. Line up the tabs on the front wheel assembly to the cab so everything locks in place. Fold the cannons to the back to cover up the hammer and complete the process. 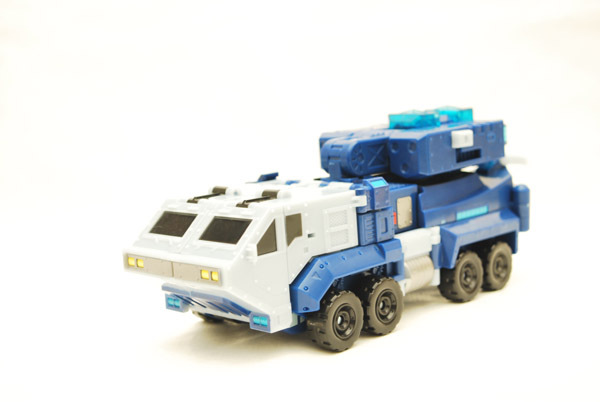 The end result is Ultra Magnus as an assault carrier. The front end is light bluish-gray and resembles a European style military cab. The rear is mostly blue with some aquamarine color thrown in here and there. There are 8 workable wheels, 4 on each side. The 4 wheels on either side are broken up by a fuel tank done in silver. The details are done fairly well here. You can make out 2 pairs of windshield wipers. the shock assemblies on the wheels and the doors on the cab. The rear end falls a little flat, with the 2 tabs being angled off a bit and the knee joints exposed. Still, it does a fair job of not sticking out too much. 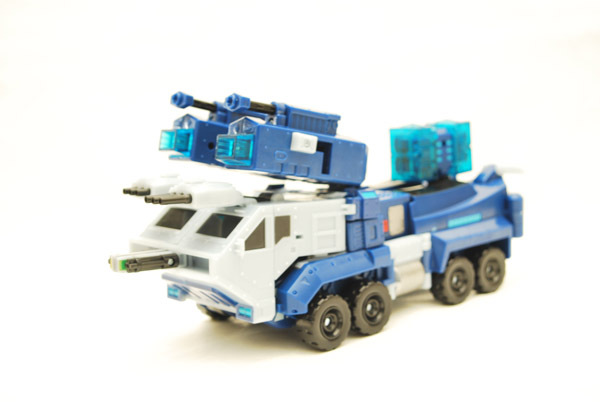 Like his robot mode, Ultra Magnus features an attack mode for his vehicle as well. 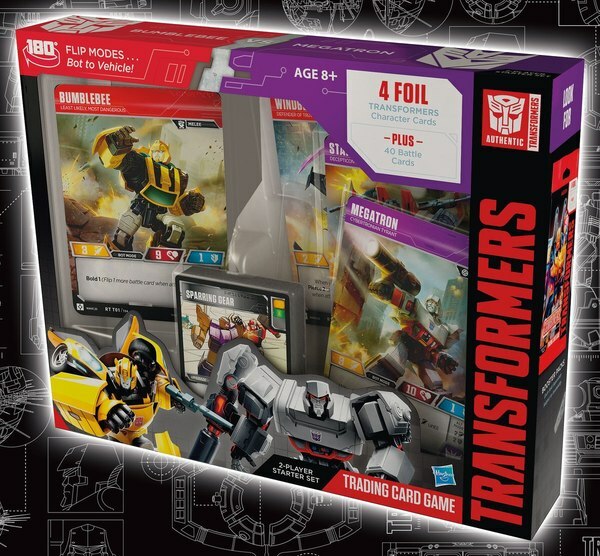 Accessing it is the same as with his robot mode. For extra effect, there is a very small red button on the left side. Pressing it will give you some sound effects and make the heavy cannons blink yellow. It's best not to press it too much unless you like being underwhelmed. 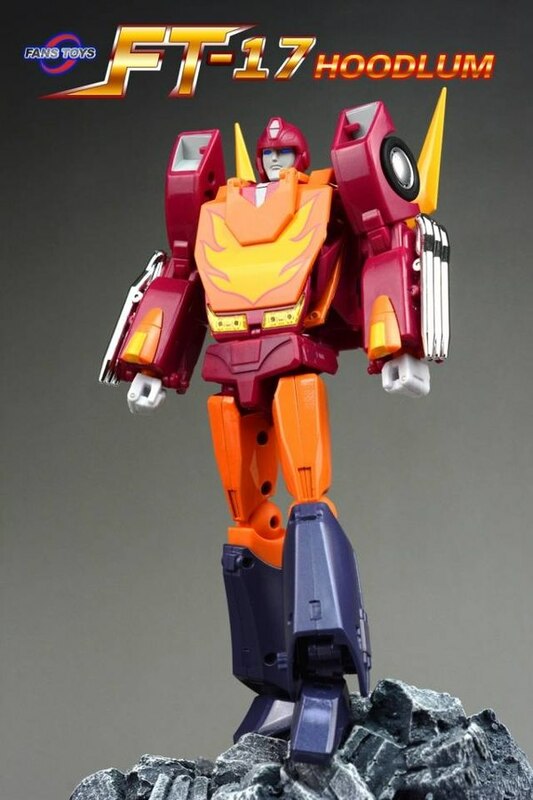 Robot Mode - :Magnus' first outing as his own bot is a smash. Lots of poseability and gimmickry to satisfy. 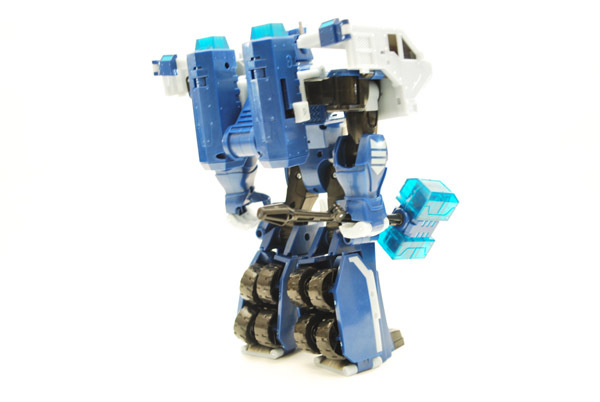 Robot Mode - :Rugged alt mode that compliments the robot inside. Overall - :Another Must Have for the collection. 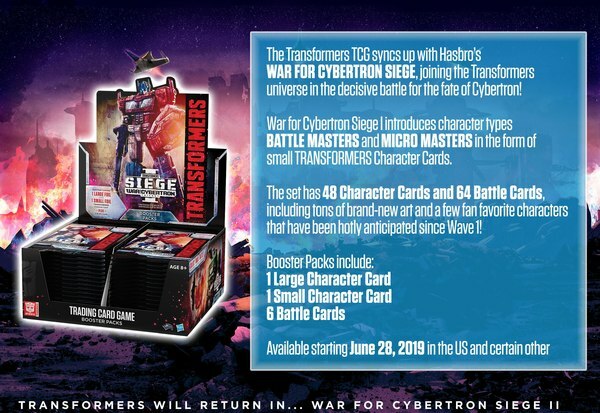 Finally, some vindication for Ultra Magnus!